'Shadows fading - See the colors will light up the sky - a Firesign? It's like the octagonal red and white stop sign to be honest. On the first couple of albums there was a real eighties flavour to the sound, the Swedes strolled down the Sunset Strip using a similar structure and path as the triple capitol "S" (Steelheart, Slaughter, Skid Row). And if some people thought of that as cheesy, then I'm not quite sure how to describe the sound on their latest effort? 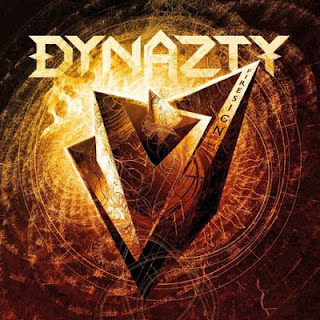 The progression of Dynazty has been very natural according to the band but some folks, including yours truly, say that it's been quite radical and unfortunately in the wrong direction, sound and quality-wise. It's been down hill and plenty of painful moments ever since the band took part in the Swedish qualification stages of Eurovision (nope. they didn't make it to the final). The content of Firesign in my opinion? Barren, sterile, too polished, melodic rock with a symphonic edge that I would describe as some kind of Eurovision Schlager Metal. Basically. All the sleazy and fun attitude and approach of the past has been replaced with keyboard and synth-driven schlock and what-not. I'd go as far as kitsch actually. Keep in mind that a lot of the eighties sleaze rooted in both rock and punk. There's definitely no punk influences on this record and thus the lack of punk-ish attitude? (duh!). Vocalist Nils Molin was recruited by Amaranthe the other year and I do enjoy the A's. You might ask why I don't enjoy this, when I can listen to everything from Soft Pop, R&B, Prog, Punk, Funk, Indie Rock, Heavy Metal, Blues, Jangle Pop, West Coast, Goth, EMO, AOR, to Speed/Thrash Metal etc. etc? I guess it's got something to do with the Scandinavian sound as of lately? I do not appreciate my rock when it's been watered down with Eurovision melodies. In fairness, this album doesn't sound like it's been tossed off one dark evening. Great production and sonics. Heather Locklear to the rescue?